It's funny the things you think about when you run. Seriously my mind wanders so much when I am out there hitting the pavement. This past weekend during my race, I had over two hours of some pretty random thougths. I mean my thoughts ranged from what I was going to eat post race to what nail polish color I was going to choose for my next pedicure. The pedicure thought then took a turn. I started thinking of how ugly my feet have gotten since I started running. We will spend all our money on running. This entails race entries, shoes, running clothes, and running accesories such as expensive running watches. We'll pay for running coaches in order to get that PR. We'll spend money on massages and PT to fix us when we are ailing. We will find any excuse to spend our money on the latest and greatest running gadget. So if you are the type of person that expects expensive gifts, forget about dating a runner. We have our own language. Yeah for those that are not in the loop it can be bit daunting. We like to throw acronyms at non-runners and expect them to know what we are saying. Here are just some of the acronyms we like to throw around: BQ, PA, DNF, DNS. We have disgusting feet. We may or may not have all our toenails. Or we may have all of them but some are black (on the verge of falling off). Oh and forget about playing footsie with us. Runners have bad callused feet. And when runners are in full training mode, expect many blisters to follow. Yeah...our feet are disgusting. We tend to be very vocal about our bodily fluids. Yeah we have no shame about discussing when our last bowel movement was, how much snot we shot out of our nose, or even how much sweat we had on our last run. Oh and I forgot to mention we may have some bad body odor after our runs. We just have some pretty disgusting habits. If we can't run, we are not happy. Part of being a runner means being at risk for injury. When injuries do occur it sidelines us from our number one passion. So you can definitely expect us to not be happy during this time. We may be bitter, angry, or get depressed. We tend to have extreme mood swings when we get injured and unable to run. "Just think of all the time we can spend together." "We can travel together to different places for races." "You'll love it, just watch!" "We can train together and make it special." Yeah the list can go on, but you get the jist. Runners are unique in their own special way. Yes we have disgusting habits but we are loyal. We are determined individauls and we value hard work. Maybe that's why my husband fell in love with me. From the start he knew running was a passion of mine. He was willing to over look all of the above reasons and love me unconditionaly. I got very lucky with him. By the way even though my husband hates my feet, he will still massage them if I ask (without gloves!). Now that is true love right there. 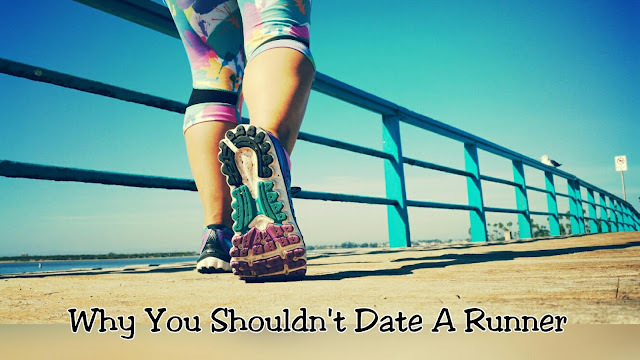 why you shouldn't date a runner? We also expect you to actually show some interest when we go on & on about our runs, our races, how we're training, yadda yadda. But then you expect us to be interested in whatever you're talking about and turnabout is fair play! #5 has been a great lesson in our marriage. Things are usually better if I can get out and run, and sometimes I'm not worth talking to until that point. We are such a special breed, very accurate list! HAHAHAHA i love this post!!! Especially the part about bodily fluids. I played rugby for 7 years and trust me, there was a LOT of that kind of talk.